Soups mean liquid, boiled dishes, which are wide spread in many cuisines. There are cold and hot soups, meat and vegetables soups, cream and clear soups. Soup should be an obligatory part of everyone's ration, because liquid dishes are important for health. So, we are glad to offer you a huge collection of healthy soup recipes. If you have lack of time or special cooking skills, it is not a problem. There are a lot of easy soup recipes on our site. 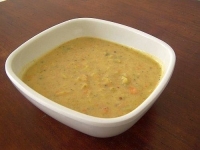 Try to make Squash Soup or Dump Soup, for instance, and you discover, that an easy dish can be also delicious. Soups made of vegetables are not less delicious than meat soups. If you are an vegetarian or just like greens dishes, a lot of our vegetable soup recipes would be very useful for you. Mark as interesting our onion soup recipes. It is considered that classic onion soup has come from France. Here, besides French variants, you can find also other ways to cook this dish, such as Swiss Onion Soup recipe. The best cabbage soup recipes are accessible for you too. They say, cabbage soup diet can help to loose extra weight. Find here different pumpkin soup recipes or butternut squash soup recipes to diversify your usual ration. Try our tastiest tomato soup recipes from fresh, stewed vegetables or tomato paste. If you need to make some healthy, low-calorie and cheap dish, use our lentil soup recipes. Mushroom soup is one of favourite meals for a lot of people all over the world. It is not surprise, because its flavour is superb. Barrow our mushroom soup recipes, such as different variants of Cream Of Mushroom Soup recipes. By the way, there are a lot of excellent ideas for cream soup recipes from absolutely different ingredients. Cream soup means a dish, ingredients of which are crushed usually by wiping or other way. We have a lot of campbells soup recipes. Campbells soups are great for quick and easy soups, which comes in a variety of different flavours. So, soups can be made by different ways to cook. Cook and eat soups with pleasure!